Kerry Gay: How has your creative process changed since the start of your career? Have you found that this process has changed from your 2013 album Oil & Water to Enough (released this month)? Faith Boblett: I used to give others’ opinions about my songs a lot more weight. That’s not to say there’s no room for collaboration - because I think that is wildly important. However, I’ve learned to trust myself more when I’m writing a song. I’ve been fortunate enough to work with some incredibly talented musicians and songwriters since the very beginning of my musical endeavors, and hope to continue to foster those relationships. I think there’s just more confidence in my own abilities now. KG: Are there any other artists (local or not) that you would be interested in collaborating with in the future? FB: I would love to collaborate with Caitlyn Smith. And Har Mar Superstar. And Sheryl Crow. And Kacey Musgraves. And Margaret Glaspy. I also really enjoy singing harmonies and backup vocals, too - so if you know anybody? Send them my way! KG: Do you have a personal favorite song of yours to perform? FB: I love playing “Clay”, which is on the new album (Enough). It feels almost visceral singing some of those lyrics; and in my head, I’m demanding that the men in the room listen to what I’m saying. KG: Do you have any advice for aspiring local artists/bands that want to follow in your footsteps? FB: My advice? Hmm. This might sound so cliche. But, my advice is to always write songs that genuinely mean something to you. At the end of the day, if you believe in what you are creating, I think things will fall into place. Sometimes that takes 3 months, and sometimes it takes 10 years. And nobody really knows what they’re doing! Be patient, have fun, love what you do. The rest shouldn’t matter. KG: Are you a fan of any bands/artists that may surprise your listeners stylistically? First Avenue and Minnesota Public Radio (MPR) have entered into an agreement for First Avenue to purchase the Fitzgerald Theater from MPR. First Avenue, one of the longest running, independently owned clubs in the U.S., is continuing to extend its reach across city lines. First Avenue’s commitment to the community made it an ideal purchaser for this space. “Our roots in the community are far-reaching and I think MPR felt good about selling to another organization that is committed to the community, to local music, and to expanding perspectives in the entertainment space,” Frank said. The deal is not finalized, and details are not yet available. First Avenue owns and operates the 250-capacity 7th St Entry, the 350-capacity Turf Club, the 650- capacity Fine Line, 1550-capacity First Avenue Mainroom, and co-operates the 2400-capacity Palace Theatre. Additionally, First Avenue promotes concerts and events at numerous venues in Minnesota, including but not limited to, Amsterdam Bar & Hall, The Cedar Cultural Center, The Historic State, Orpheum, and Pantages Theatres in Minneapolis, as well as Surly Brewing Festival Field. First Avenue is celebrated as one of the longest-running, independently owned and operated clubs in the United States. Its commitment to independence is led by the belief that unique, locally-owned live music rooms are imperative to the health of the community and economy. First Avenue is dedicated to promoting artistic expression in voices old and new, to provide a community by offering artists a stage and a mic, and fans a place to gather. As the musical epicenter of the Twin Cities, First Avenue—and by extension, the venues it owns and operates—opens its doors to all of the thousands of music lovers who are First Avenue's past, present, and future. Please e-mail your resume, cover letter and references to jobs@first-avenue.com. First Avenue, the Twin Cities’ premier entertainment venue and music promoter, is seeking a dynamic and self-motivated individual to help lead the kitchen for The Depot Tavern with possible additional roles for the right candidate. The Kitchen Manager is detail-oriented, focused, and can work quickly and efficiently with distractions in a fun and fast-paced environment. This position is part cooking, part staff hiring, development, and training, with an emphasis on Menu development, execution and ongoing training. The right candidate should have relevant experience in these fields. A passion for music is a must, as this position works directly for The Depot Tavern, First Avenue & 7th St Entry, Turf Club, and Palace Theatre, as well as other special events and festivals. This position reports directly to the Director of General Operations. This is a full-time, exempt position. On occasion may be required to work nights, weekends, and holidays in addition to normal business hours. 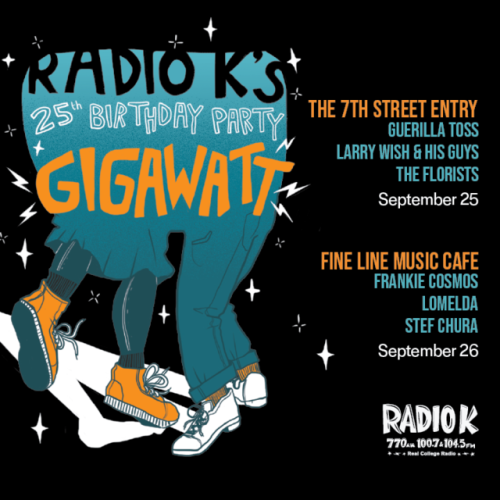 We’re celebrating 25 years with Radio K!